Afton Road, Central Mojave Desert, California: UPRR Trestle. The World's Tallest Thermometer in Baker, CA. The Mad Greek Restaurant in Baker, California. Sun setting on Barber Mountain. This view looks east, and Hole in the Wall is on the other side of the mountain. This mountain is not formally named "Barber Mountain," but the Barber VABM is located on top. The climb to the top is about 300 meters and takes about an hour. Wild Horse Canyon Road - Mojave National Preserve: Lobo Point. Photographed April 1980, scanned from a print on 6 March 2018. Lobo Point Road: near Barber Mtn. Lobo Point Road: correlation of rock units. Photograph taken in June, 2000. Originally the headquarters of the Briggs and Murphy Ranch. Joined with other ranches into the Rock Springs Land and Cattle Company in 1894. The site of Barnwell was reached by the Nevada Southern Railway in 1893. At that time the site was named Manvel for the current president of the Santa Fe railroad. The railroad was reorganized as the California Eastern Railway in 1895, and the branch line to Searchlight built in 1906-1907. The name of this site was changed to Barnwell in 1907, named for a telegraph operator stationed there by the railroad company. Ivanpah Road - Mojave National Preserve: Barnwell. Routes to Desert Watering Places in the Mohave Desert Region, California: at Barnwell. Crossing the Union Pacific tracks at Basin. Basin Road - Mojave Desert: at tracks. Field Notes: 16 Apr 2017. Cows along Black Canyon Road. Black Canyon Road - Mojave National Preserve: at Gold Valley Ranch. Frequently Asked Questions: Desert Impacts. Black Canyon Road, looking north from near Gold Valley Ranch. The low gray shrubs are Blackbrush (Coleogyne ramosissima>) and the large green shrubs are Utah Juniper (Juniperus osteosperma). This photograph was taken from a location about 50 meters north of the cows as seen in the photograph below. At first glance the vegetation might be classified as "pristine," as indeed much of the Mid Hills vegetation has been characterized. However, on closer examination there are many signs of usage by cattle, and it becomes impossible to know what the native vegetation might have been at this site. Black Canyon Road - Mojave National Preserve: near Gold Valley Ranch. Photograph taken April 19. 2008. The "road" to this location ultimately ate eight tires on a field trip containing about 25 autos. U. S. Highway 66 -- The National Trails Highway: just north of Amboy. Photograph taken April 19, 2008. The brownish outcrop in the middleground is tilted Peach Springs Tuff. Eastern Mojave Geology -- A Botanist's View: Peach Spr Tuff. Amboy Road, San Bernardino County, California: on Bristol Lk Playa. Amboy Road, San Bernardino County, California: 20000. Crucero Road, San Bernardino County, California: 66000. Tonopah & Tidewater Railroad: on Broadwell Lake. Cadiz Road: near Ship Mtns. Field Notes: near Ship Mtns. Photographed April 1981, scanned from a print on 11 March 2018. Field Notes: 1981 desert studies. Unusual rock formation in Caruthers Canyon. This often photographed rock formation in Caruthers Canyon, was also photographed by Annie Alexander and placed in her notebook with the notation of Fourth of July Canyon. It tells me that Annie was actually in Caruthers Canyon during her visit of 1940, and not in Fourth of July Canyon as her notebook states. Caruthers Canyon Road - Mojave National Preserve: near unusual rock formation. This photograph was taken from a location near where Annie or Louise took their photograph on page 44a. By GPS, the location is 11S 0654416 3899242. Caruthers Canyon Road - Mojave National Preserve: in lower Caruthers Cyn. My dad in Caruthers Canyon, below the Giant Ledge Mine, after a November rainstorm. Caruthers Canyon Road - Mojave National Preserve: Stream. Caruthers Canyon as seen from New York Mountain Road. Photographed April 1981, scanned from a print 6 February 2018. Castle Peaks, Castle Mountains, etc. Photograph taken April 22, 2004. Ivanpah Road - Mojave National Preserve: 14010. near Purdy. The Hackberry Conplex Fire, driven by south winds, came toward the camera, and turned east along the south face of Pinto Mountain. Cedar Canyon Road - Mojave National Preserve: 18600. Field Notes: 15-Oct-05 at Pinto Mountain. Patchy burned areas on Pinto Mountain. In Cedar Canyon, we stopped to look at the location of my plot on Pinto Mountain. Again we were surprised by the patchy distribution of burned areas. Cedar Canyon Road - Mojave National Preserve: 18500. Field Notes: 15-Oct-05 in Cedar Cyn. Photograph taken October 16, 2005. Cedar Canyon Road - Mojave National Preserve: in Cedar Canyon. Field Notes: 16-Oct-05 in Cedar Canyon. Kelso Cima Road - Mojave National Preserve: at Cima. Cross beside Kessler Springs Road on Cima Dome. Apparently this cross has caused some controversy about whether it is an appropriate icon in a national park, and there has been some discussion about removing it. Kessler Springs Road - Mojave National Preserve: at Veterans Cross. Photograph taken May 27, 2008. Kessler Springs Road - Mojave National Preserve: near pass. A Bibliography on Blackbrush (Coleogyne ramosissima): on Cima Dome. The Cross on Kessler Springs Road -- Covered this time. When I passed by the cross on April 21, 2004, it was covered by the cardboard box, as shown. Someone has scrawled markings that look faintly religious on the box. Despite news reports that the cross is covered by a heavy tarp, it has been several years since I have seen the tarp. I passed by the cross again on Sunday, May 22, 2004. This time there was no covering for the cross. Meanwhile, the Ninth Circuit Court of Appeals, released a ruling on June 8, 2004, that the cross violated the Establishment clause. In the Department of Defense Appropriations Act of 2004, Rep. Jerry Lewis (R- San Bernardino) was able to insert a clause requiring the Department of Interior to transfer the property to private owners. The court, however, said that the transfer may take several years, and therefore the case is not moot. All this caused by a single retired Park Service employee, who in fact claims to be religious. Field Notes: May 27, 2012. Clark Mountain as seen from Kessler Springs Road. Two trucks on Interstate 15 can be faintly seen in the left middle ground. Kessler Springs Road - Mojave National Preserve: View of Clark Mountain. Field Notes: 6-Jun-06 at Clark Mtn. Heading down from the Coliseum Mine. Field Notes: 6-Jun-06 near Clark Mtn. View of Clark Mountain from the north. Kingston Road - Eastern Mojave Desert: near Excelsior Mine Rd. Location of Clark Mountain Station. U. S. Interstate 15: Clark Mountain Station. Photograph taken in May, 1999. West side of Clark Mountain. Kingston Road - Eastern Mojave Desert: Pachalka Spring. Canyon on west side of Clark Mountain. Photograph taken in May, 1999, near Pachalka Spring. Field Notes: 6-Jun-06 at Coliseum Mine. Columbia Mountain as seen from the Blue Rock Mine in Macedonia Canyon. At the very top of Columbia Mountain is an excellent example of supergene enrichment of copper ores. The idea behind supergene enrichment goes something like this. In the beginning there was a small amount of copper mineralization in the ore vein. As the mountain eroded away, the copper minerals were dissolved and then redeposited a few feet deeper in the vein. As a result the copper vein at the surface looks to be very rich. But just a few feet below the surface there is very little copper. Someone built a road to the top of Columbia Mountain, and dug some exploratory trenches in rich copper veins right on the very top of the mountain. However as soon as they got a few feet down, the vein was not rich enough to continue digging. Macedonia Canyon Road - Mojave National Preserve: Columbia Mountain. BLM Route NN 580 (Cree Camp Road): near Cree Camp. BLM Route NN 580 (Cree Camp Road): at Hytens(?) Well. BLM Route NN 580 (Cree Camp Road): 38000. BLM Route NN 580 (Cree Camp Road): above Cree Camp. Union Pacific Maintenance Road, San Bernardino County, California: near Crucero. Tonopah & Tidewater Railroad: Crucero. We were supposed to take the old telegraph road where the pickup is at left, but most of our caravan missed it. Photograph taken September 22, 2000. Notice how green the landscape is. The summer of 2000 brought several good rainstorms to this area. Lanfair Road - Mojave National Preserve: near Vontrigger Hills and Spring. Field Notes: Fenner Valley, September 22, 2000. Page 3 (Map) of the Irwin Letter. Page 2 of the Irwin letter. Ivanpah Road - Mojave National Preserve: at Lanfair and Cedar Canyon Roads..
Lanfair Road - Mojave National Preserve: at Goffs. Field Notes: Goff, September 22, 2000. This view looks northeast toward Table Top at the left distance. Black Canyon Road - Mojave National Preserve: in Gold Valley. A Bibliography on Blackbrush (Coleogyne ramosissima): in Gold Valley. This view looks southwest towards Barber Mountain. The foreground burned in June, 2005. This view looks southeast towards the Woods Mountains. View is to the northeast. Routes to Desert Watering Places in the Mohave Desert Region, California: 207004200. Between Francis Spring and Turquoise Mountain. View is to the east. Routes to Desert Watering Places in the Mohave Desert Region, California: 207004100. Routes to Desert Watering Places in the Mohave Desert Region, California: 207004050. View of the Hollow Hills and Turquoise Mountain across Soda Lake. Photograph taken 23-April-06 from Zzyzx Road. Looking across Soda Lake, the Hollow Hills form the skyline on the left half, whereas Turquoise Mountain with communications equipment is just right of center. Squaw Mountain barely breaks the skyline to the right. Halloran Springs Road: at Cree Camp Road. Turquoise Mountain with radio towers in the distance. Routes to Desert Watering Places in the Mohave Desert Region, California: 207004879. Field Notes: at the Wander Mine. Mine shaft at unknown mine. The hoist anchor is between the shaft and my car. Routes to Desert Watering Places in the Mohave Desert Region, California: 207004882. The Avawatz Mountains are in the right distance. This is the intersection of Thompson's (1921) route from Silver Lake to Goodsprings, and Halloran Springs Road. Routes to Desert Watering Places in the Mohave Desert Region, California: 207004881. Communications equipment on top of Turquoise Mountain. Hoist anchor at unknown mine. View looking east from Turquoise Mountain Road in the direction of Francis Spring. Routes to Desert Watering Places in the Mohave Desert Region, California: 207004400. Photograph taken 23-April-06 from the vicinity of Hytens Well on Halloran Springs Road..
Solomons Knob is the volcanic neck in the right middleground. Bull Spring Wash runs diagonally at the base of Solomons Knob. Clark Mountain is seen in the left distance. Road north to Turquoise Mountain. Map created from http://terraserver-usa.com/usgsentry.aspx?T=2&S=12&Z=11&X=744&Y=4897&W=3 on 7-May-06, shows the location of Hytens Well on the Turquoise Mountain quadrangle, and the location as shown in literature. Routes to Desert Watering Places in the Mohave Desert Region, California: 207004700. Routes to Desert Watering Places in the Mohave Desert Region, California: 207004751. BLM Route NN 580 (Cree Camp Road): at Wander Mine. Halloran Springs Road: near Turquoise Mtn. Francis Spring Road: near Solomons Knob. Bull Spring Wash, looking downstream to the southwest. Francis Spring Road: in Bull Spring Wash.
Bull Spring with Solomons Knob in the background. Francis Spring Road: near Bull Spring. Field Notes: 23-Apr-06 at Bull Spring. Photograph taken 23 April 2005. Francis Spring Road: at Francis Spring. Routes to Desert Watering Places in the Mohave Desert Region, California: at Francis Spring. Routes to Desert Watering Places in the Mohave Desert Region, California: 207003760. Routes to Desert Watering Places in the Mohave Desert Region, California: 207003820. Bull Spring Wash looking northeast. General view of the campground at Hole in the Wall. The slot canyon from which Hole in the Wall got its name is in the center. The peaks of the Providence Mountains can be seen in the distance. Black Canyon Road - Mojave National Preserve: 34000. Photograph taken May 22, 2004. Wild Horse Canyon Road - Mojave National Preserve: Spur road to Banshee Canyon. Frequently Asked Questions: Hole in the Wall. Two camp sites in the campground at Hole in the Wall. While Hole in the Wall is a very pretty area, the camp sites are exposed to wind and sun, except in the late afternoon. Black Canyon Road - Mojave National Preserve: 32000. George Hilton in the red hat at right, “Matt” next to him, but I do not recognize any others. Wild Horse Canyon Road - Mojave National Preserve: near Banshee Cyn. Photographed April 1988, scanned from a print 9 February 2018. Field Notes: 1988 Desert Studies Field Trip. Photographed April 1980, scanned from a print on 18 February 2018. Black Canyon Road - Mojave National Preserve: Hole-in-the-Wall. Field Notes: 6-Jun-06 in Coliseum Gorge. Ivanpah Road at the Union Pacific Railroad. One of the several places called "Ivanpah" is the Ivanpah Road crossing of the Union Pacific Railroad. View from the site of the original Ivanpah, now called Ivanpah Springs. Field Notes: 6-Jun-06 near Ivanpah. U. S. Interstate 15 descends from Wheaton Pass past Nipton Road, crossing Ivanpah Lake in route to Primm, Nevada. Nipton Road - Eastern Mojave Desert: near US I-15. Routes to Desert Watering Places in the Mohave Desert Region, California: 235101600. The west end of the Ivanpah Mountains as seen from Kessler Springs Road. Kessler Springs Road - Mojave National Preserve: 16000. Nipton Road - Eastern Mojave Desert: near Nipton. Nipton Road - Eastern Mojave Desert: near Murphy Well. Castle Peaks across the Ivanpah Valley. Nipton Road - Eastern Mojave Desert: 10710. Nipton across the Ivanpah Valley. Crescent Peak, Nevada, in the distance. The Ivanpah Bird Fryer in operation. Signs on Kelbaker Road, leaving Baker. Kelbaker Road - Mojave National Preserve: 11000. Kelbaker Road near Baker in an El Niño Spring rain. From Baker, the road climbs 1100 ft up a broad bajada on the northwest slope of Cima Dome into the Cima Volcanic Field. Kelbaker Road - Mojave National Preserve: outside of Baker. Kelbaker Road - Mojave National Preserve: along road. Kelbaker Road - Mojave National Preserve: near US I-40. Kelbaker Road - Mojave National Preserve: near Kelso Dunes. Field Notes: 16-Oct-05 in Kelso. When we arrived in Kelso, the egrets were still roosting in the trees. As we were walking around and looking at the Kelso Depot, the egrets began to circle, and then headed south. Kelso Dunes as seen from Kelbaker Road north of Kelso. Kelbaker Road - Mojave National Preserve: 20000. Photographed April 1980, scanned from a print on 4 March 2018. The Mojave-mobile where the Dudleya were found. Power Line Road: Rocky Ridge. The field trip of the 2001 Desert Research Symposium descends from Rocky Ridge into Jackass Canyon. Rocky Ridge is entirely sedimentary in origin. The steep slope in the left middleground was covered by Beavertail Opuntia basilaris in bloom. Photograph taken April 22, 2001. Field Notes: Rocky Ridge, April 22, 2001. Photograph taken May 27, 2001. Power Line Road: Kelso Peak. A Union Pacific train waits for a green signal at Elnora along Kelso-Cima Road. Kelso Cima Road - Mojave National Preserve: at Elnora. Kelso Cima Road - Mojave National Preserve: at B-195. View of Mountain Pass Rare Earth Mine from the east slope of Kokoweef Peak. Lanfair Valley and Hackberry Mountain, seen from the New York Mountains. The Lanfair Valley is bounded by the New York Mountains on the north, and HackBerry Mountain on the south. The eastern boundary would be the Piute Mountains, while Lanfair Valley extends west to Rock Spring. This photograph was taken just east of Caruthers Canyon. I had walked up on the foothills of the New York Mountains in search of Frasera albomarginata. New York Mountain Road can be seen in the foreground. New York Mountain Road - Mojave National Preserve: View of Hackberry Mountain. There is a telephone near the intersection of Cedar Canyon Road, Lanfair Road, and Ivanpah Road. The new telephone has a telephone number, which unfortunately I don't know. The old telephone number was "Lanfair #1." The old telephone looked like this. Lanfair Road - Mojave National Preserve: Lanfair. Lanfair Road - Mojave National Preserve: 11800. Locations of various authors' field work in the eastern Mojave desert. David Thompson's (1920) map of Lanfair Valley. This is Plate VI from Thompson, David G., 1920. I was particularly interested in this map because it shows the location of Ledge. This map shows it also to be known as Maruba P. O. It was at Ledge that miners directed Annie Alexander and Louise Kellogg to the south side of the New York Mountains in 1940 because the road to Keystone Canyon was washed out. Sunset at Lobo Point after a rainstorm. This photo was taken in March, 1998, after a strong, warm El Niño rain. This view looks west. Pretty much every Pinyon and Juniper burned, except in sheltered areas such as the right background. Field Notes: 15-Oct-05 at Lobo Point. In the Lobo Point campground there was one Pinyon that was perhaps 3-4 feet tall when I first camped there in 1980. Over the years, it grew to more than 12 feet tall. However, it looks too badly burned to survive. This would be in the extreme right of the photograph link a left. Panning to the left, though, one can see a Juniper that is scorched and brown on one side, but not burned. Then an Antelope Bitterbrush (Purshia tridentata (Pursh) DC ssp. glandulosa (Curran) M. E. Jones), a Box Thorn (Lycium cooperi A. Gray), and finally a large Pinyon (Pinus monophylla Torrey & Fremont) that did not burn. These plants should provide seed to re-establish the vegetation in this little valley. Photograph taken 1 June 2010. Field Notes: 1 Jun 2010. Juniper singed in the lower branches. In the valley of Lobo Point, there is an informal campground. This is the location that Merritt College camped for many years. There is an old, scarred Juniper here. It's been shot, sawed, axed, and had every other manner insult. My contribution has been to eat lunch here at least once in every trip to the eastern Mojave, and to sit in the shade while enjoying the view of Lobo Point. I also confess to saving up the saving up the melt water in the cooler, and draining it somewhere in the drip line of the Juniper. Map showing the location of Lobo Point and the north slope of Wild Horse Mesa relative to Hole-in-the-Wall. Prepared on August 3, 2008, this is the current (November 2009) map showing the location of Lobo Point. Field Notes: 28 Nov 2009. Portfolio of Maps: in August 2008. The Vegetation of Lobo Point and North Wild Horse Mesa, Mojave National Preserve, San Bernardino County, California. : 02000. Map was prepared in January 1996. It was the first map used on my web site to show the location of Lobo Point, and was replaced by the map of December 18, 2006. Portfolio of Maps: in January 1996. At work at Lobo Point. This is me, hard at work, studying the latest issue of PC Week, in the Eastern Mojave Field Office of Office Systems and End User Support. This map was prepared in December 18, 2006. It may be the first map used on my web site that was prepared using ArcGIS. It was replaced by my map of August 3, 2008. Portfolio of Maps: in December 2006. Photograph taken October 15, 2005 near Lobo Point, Mojave National Preserve. Looking northeast from the slopes of Lobo Point toward Gold Valley Mine, one could see numerous Junipers and a few Pinyons that did not burn, especially in the low places along washes. Protographed April 1985, scanned from a print 6 February 2018. Field Notes: 1985 Desert Studies. Lobo Point Road: north of Lobo Point. Field Notes: 28 May 2012. Field Notes: near Lobo Point. Photographed April 1991, scanned from a print 8 February 2018. Field Notes: Desert Studies Field Trip. Photographed April 1980, scanned from a print on 11 March 2018. Lobo Point Road: top of hill. Photographed April 1986, scanned from a print 8 February 2018. Macedonia Canyon Road - Mojave National Preserve: 20500. Upper section of Macedonia Canyon. The road is in the wash. There are several stone cabins in this portion of the canyon. Macedonia Canyon Road - Mojave National Preserve: Stone Cabin. Railroad bridge over Macedonia Canyon Road. Kelso Cima Road - Mojave National Preserve: at Macedonia Canyon Road. Macedonia Canyon Road - Mojave National Preserve: 37000. Sketch map of Macedonia Canyon Road. USGS map showing Marl Spring Location. The route that I took is indicated in green. I think next time I will try the alternate route marked in yellow. It will avoid the rough road through the canyons. Power Line Road: Marl Spring Road. Routes to Desert Watering Places in the Mohave Desert Region, California: at Marl Spring. The uppermost mine is the Blue Buzzard Mine and the lower mine is the Iron Horse Mine. I thought this might be good territory to check for Frasera albomarginata in the future. Striped Mountain in Piute Valley. Portion of Thompson's (1921) Plate XII showing Mescal Spring. Routes to Desert Watering Places in the Mohave Desert Region, California: near Mescal Spring. Morning Star Mine Road - Mojave National Preserve: 25000. Photograph taken April 20, 2004. This was a cloudy day. This little hill, right beside the road, is the southernmost hill in the Winters Pass Hills. The rocks on the top of the hill are Noonday Dolomite. Kingston Road - Eastern Mojave Desert: at Winters Pass Hills. Field Notes: 20 Apr 04 near Winters Pass Hills. Photograph taken April 20, 2004. View is of the South Mesquite Mountains. Photograph taken April 20, 2004. Kingston Road - Eastern Mojave Desert: 49900. Routes to Desert Watering Places in the Mohave Desert Region, California: near Winters Pass. Large Barrel Cactus on quartzite outcrop. I walked up to the quartzite outcrop on the southeast side of Kingston Road, just northwest of Winters Pass. On the way back to the car, I collected two different Atriplexes. Location was 11S 3953350 618750, elevation: 1000 m.
Kingston Road - Eastern Mojave Desert: 43000. Photograph taken April 20, 2004. Kingston Road crosses the photograph at bottom. Kingston Road - Eastern Mojave Desert: 34000. View of Mesquite Mountains summit from Winters Pass. Photograph taken 21 April 2005. I have climbed to the summit of this portion of the Mesquite Mountains as shown in the left background. A direct approach to this summit would lead one into some pretty rough climbing. Instead, I would recommend following an old road east as far as it leads to a saddle overlooking the Mesquite Valley, then turning north, climbing a ridge line, but staying a little to the east, to avoid the cliffs. Kingston Road - Eastern Mojave Desert: near Winters Pass. Field Notes: 21-Apr-05 at Winters Pass. Photograph taken April 20, 2004. This photograph gives a better sense of Winters Pass being a broad, low pass between the north and south Mesquite Mountains. Cheryl relaxes amongst the Blackbrush in the Mesquite Mountains. Photograph taken 20 April 2005. Actually Cheryl wasn't relaxing very much, as she was sitting on a very sharp slab of limestone. This is also very close to the location of my collection number 450. Limestone slope in the central Mesquite Mountains. Photograph taken 21 April 2005. The buff-colored limestone in the middle of the photo is the location where I found so many Mimulus bigelovii in bloom. Field Notes: 21-Apr-05 at end of old road. Field Notes: 21-Apr-05 at summit of Mesquite Mtns. GoogleEarth image with aircraft flying over Mesquite Mountains. Field Notes: 6 Jun 2006. The route I took to the top of the Mesquite Mountains. Disclaimer: This is the route I took. I am not recommending it to you, nor am I suggesting it is a good route. Do whay you want, don't take any advice from me. Crucero Road, San Bernardino County, California: 34000. Tonopah & Tidewater Railroad: Mesquite. Looking west into California and the Mesquite Mountains. This photo was taken from the approximate center of Mesquite Valley. Kingston Road - Eastern Mojave Desert: 33000. Dust blown off the surface of Mesquite Lake. Field Notes: 18 Apr 2017. Looking south on Wild Horse Canyon Road. Wild Horse Canyon Road - Mojave National Preserve: s. of Silver Lead Spr. Field Notes: 15-Oct-05 on Wild Horse Cyn Rd. Wild Horse Canyon Road - Mojave National Preserve: w. of Mid Hills CG. Portfolio of Maps: in May 2008. An area in the Mid Hills after the Hackberry Complex Fire. Field Notes: 15-Oct-05 in the Mid Hills. Wild Horse Canyon Road - Mojave National Preserve: near Silver Lead Spr. Wild Horse Canyon Road - Mojave National Preserve: at Mid Hills CG. Photograph taken June 27, 2005. Courtesy of Phillip Woodall. Effects of the Hackberry Complex Fire in Mojave National Preserve, June 22-25, 2005.: 252010. Field Notes: 6-Jun-06 at Mid Hills Campground,. Relaxing in Mid Hills Campground. Wild Horse Canyon Road - Mojave National Preserve: near Mid Hills CG. Effects of the Hackberry Complex Fire in Mojave National Preserve, June 22-25, 2005.: 252005. Effects of the Hackberry Complex Fire in Mojave National Preserve, June 22-25, 2005.: 252030. Effects of the Hackberry Complex Fire in Mojave National Preserve, June 22-25, 2005.: 252020. The white splotches are indeed snow flakes. Photograph taken in April 1980. Essex Road: at Mitchell Caverns. Climate of the Eastern Mojave Desert: 32000. Photograph taken May 29, 2005. Many of the brown-ish junipers are dead from several years of drought. Field Notes: 29 May 2005. Ivanpah Road - Mojave National Preserve: 19970. Black Canyon Road - Mojave National Preserve: 17510. Ivanpah Road - Mojave National Preserve: 19980. Black Canyon Road - Mojave National Preserve: 17490. Entrance sign near Valley Wells. Kessler Springs Road - Mojave National Preserve: at MNP Entrance. Little Cow Hole Mountains from Zzyzx Road. Cedar Canyon Road - Mojave National Preserve: Mojave Road. Kelso Cima Road - Mojave National Preserve: at Cedar Canyon Road. BLM Road 8344, San Bernardino County, California: near Dunn Road. 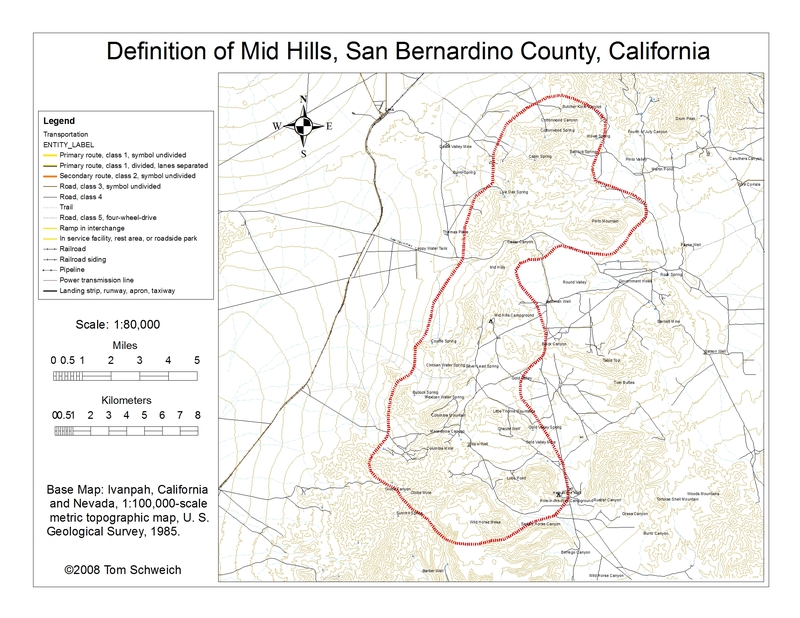 Dunn Road, San Bernardino County, California: at BLM 8344. Field Notes: at Stop 2017-2-5. Dacite dome of unknown age. It may be part of a larger dome to the east that lies on metamorphoc rocks (Walker et al., 1990). Dunn Road, San Bernardino County, California: at dacite dome. Field Notes: 17 Apr 2017. BLM Road 8344, San Bernardino County, California: at Stop 2017-2-5. Dunn Road, San Bernardino County, California: at Stop 2017-2-3. Field Notes: at Stop 2017-2-3. Wagon at Daggett Historical Museum. Daggett-Yermo Road, San Bernardino County, California: at Mojave Rd. This view is looking west in the mid-morning. Ivanpah Road - Mojave National Preserve: 19990. New York Mountain Road in Ross Horse Pasture. This is New York Mountain Road between Caruthers Canyon and Lanfair Road. This area is called Ross Horse Pasture. New York Mountain Road - Mojave National Preserve: at Ross Horse Pasture. Cedar Canyon Road - Mojave National Preserve: 37900. New York Mountains, as seen from the east on Ivanpah Road. Photograph taken May 30, 2005, at Barnwell (Manvel). Ivanpah Road - Mojave National Preserve: near Barnwell..
Providence Mountains from Kelbaker Road. The Providence Mountains are very rugged on the northwest face shown here, and easier to visit from the southeast side. The Mid Hills are the northeast extension of the Providence Mountains ridge line as seen at left. Kelbaker Road - Mojave National Preserve: 18000. Photograph taken 19 December 2008 by Phil Woodall. Essex Road: in Fenner Valley. Photographed April 1984. Scanned from a print 5 February 2018. Left to right: Roland Gangloff, Scott Clarke, Jim Lons, Julie, and Gray. Summit Spring Road - Mojave National Preserve: at Providence Mine. Photographed April 1984, scanned from a print 5 February 2018. Summit Spring Road - Mojave National Preserve: at Summit Spr. Cedar Canyon Road - Mojave National Preserve: 40000. Rock Spring is in an un-named wash that that drains Round Valley. As the wash comes through the granite, the water is forced to the surface, making Rock Spring one of the more reliable springs in the eastern Mojave. Rock Spring empties into Watson Wash which can be seen in the distance. Cedar Canyon Road - Mojave National Preserve: 42000. Photographed in April 1981 (Photo 8143-14). The Bert Smith Rock House, was also occupied for a time by Carl Faber, who is a well-known desert artist. Photograph taken May 28, 2008. Black Canyon Road - Mojave National Preserve: at Holliman Well. Intersection of Wild Horse Canyon and Black Canyon Roads after Hackberry Complex Fire. This panorama, taken June 27, 2005, after the Hackberry Complex Fire of June 22-25, 2005, shows that much of Round Valley burned as well as a good portion of Pinto Mountain. Black Canyon Road - Mojave National Preserve: Near Wild Horse Canyon Road. Wild Horse Canyon Road - Mojave National Preserve: Near Black Canyon Rd.. Effects of the Hackberry Complex Fire in Mojave National Preserve, June 22-25, 2005.: … in Round Valley.. Round Valley near Mid Hills Campground. The vegetation in the foreground is Basin Sagebrush (Artemisia tridentata) with Utah Juniper (Juniperus osteosperma). The primary rock type here is granite, which makes up the rock pile in the center ground. Pinto Mountain is the striped mountain at left. The peaks of the New York Mountains can be seen in the distance. Wild Horse Canyon Road - Mojave National Preserve: Round Valley. Pinto Mountain across Round Valley as seen from Black Canyon Road. The gray shrubs are Basin Sagebrush (Artemisia tridentata) and the large green shrubs are Utah Juniper (Juniperus osteosperma). Pinto Mountain is composed of Hole-in-the-Wall Tuff, Winkler Formation, and Peach Springs Tuff. In the loose rock at the base of Pinto Mountain are boulders of gneiss and schist. That would indicate to me that the basement rock under Pinto Mountain is at or very near the surface. Black Canyon Road - Mojave National Preserve: in Round Valley. Autecology of Desert Elkweed Frasera albomarginata S. Watson (Syn: Swertia a.) Gentianaceae in the American Southwest: at Pinto Mountain. California Highway 127: at Salt Creek. Eastern Star Wash in the Shadow Mountains. Field trip stop in Eastern Star Wash.
Kingston Range in the background. Field Notes: at Field Trip Stop 1-1. Someone hollered, "There are bird tracks up here," setting off a mad scramble. Field Notes: 22-Apr-06 Bird Tracks. Kingston Road on the east side of the Mesquite Mountains. View of Shadow Valley, the Mesquite Mountains, and the Spring Mountains. Photograph taken 20 April 2005 from Kingston Road, a few miles north of Valley Wells. Kingston Road - Eastern Mojave Desert: 87000. Field Notes: at the gate. Joshua tree and creosote bush in Shadow Valley. This is Field Trip Stop 1-3 from Reynolds (2006). The Liesegang weathering is one line of evidence that the hills to the west are massive slide blocks over a deeply weathered surface. Field Notes: at Field Trip Stop 1-3. Silurian Hills, as seen from the north. Photograph taken 22-April-06 on Kingston Wash Road, east of Valjean. Field Notes: 22-Apr_06 at Valjean. Cut on the former Tonopah & Tidewater Railroad. Photograph taken 22-April-06. This cut is in the Silurian Hills, and looks north to the Dumont Hills. Field Notes: at Field Trip Stop 1-2. Tonopah & Tidewater Railroad: 42100. Brian and Joe review the stratigraphy of the Silurian Hills. Field Notes: 22-Apr-06 in the Silurian Hills.. The beginning of Halloran Springs Road in Silver Lake. According to the map, this is the beginning of Halloran Springs Road in Silver Lake. In theory it should run sub parallel to the power line road and eventually merge with it about three miles up the slope. Halloran Springs Road: near Silver Lake. Ridge lines silhouetted by the setting sun. Photograph taken 22-April-06 from Silurian Lake, showing the successive ridge lines of the Salt Spring Hills, the Saddle Peak Hills, and the Ibex Hills. Close to the end of Halloran Springs Road. From this point I had to do a little cross-country driving, crossing two berms to get to a power line tower. From the tower I was able to use a power company access road to get to the Power Line Road. Halloran Springs Road: near Power Line Rd. California Highway 127: at Silver Lake (site). Avawatz Mountains from CA Highway 127. As I was taking this photograph, a truck turned left from California Highway 127 onto this road. It was an open trailer for gravel or other bulk commodity. I would guess that Thompson's (1921) route from Barstow to Silver Lake (site) crossed Silver Lake at approximately this location. California Highway 127: near Silver Lake. 4WD Road, San Bernardino County, California. : at pkg. Field Notes: at Stop 2017-1-2. California Highway 127: at Silver Lake spillway. The town of Baker is in the distance, across the playa of Silver Lake. Soda Lake, looking south from Soda Springs. Photograph taken April 27, 2001. Soda Mountains from the shores of Soda Lake. U. S. Interstate 15: 53100. View of Soda Lake from the Lanai at the Zzyzx Hilton. A typical room at Soda Springs Desert Studies Center. Cheryl relaxes on the lanai at Five-Star Zzyzx Hilton. Striped Mountain as seen from Kessler Springs Road. There are many "Striped Mountains" or "Striped Buttes" in the desert regions ot the southwest. This one is between the Mescal Range and the Ivanpah Mountains of the eastern Mojave Desert. Kessler Springs Road - Mojave National Preserve: near Striped Mountain. Photographed April 1985, scanned from a print 8 February 2018. I think the view is slightly east of south, and the wash in the right middle ground is Woods Wash. The straight line is the road into the northeast corner of the Woods Mountains. The flat-topped mountain to the east of Black Canyon Road is Table Top. Geologic reports note that the Table Top is granite, topped by a quartz latite lava flow. The top surface is flat as it appears to be from the road. For most of its flat top, the vegetation consists of only two species, Basin Sagebrush (Artemisia tridentata) and Utah Juniper (Juniperus osteosperma). Crucero Road, San Bernardino County, California: at megaphone. U. S. Highway 66 -- The National Trails Highway: between Bagdad and Siberia. Photograph taken on April 19, 2004. I struggled a bit to find something photogenic in Essex, and finally settled on this view. U. S. Highway 66 -- The National Trails Highway: at Essex. Photograph taken on April 19, 2004. U. S. Highway 66 -- The National Trails Highway: 20500. The café did not appear to be open on April 19, 2004, when I took this photo. U. S. Highway 66 -- The National Trails Highway: Amboy. Routes to Desert Watering Places in the Mohave Desert Region, California: at Valley Wells copper smelter. Excerpt from Thompson's (1921) map. Routes to Desert Watering Places in the Mohave Desert Region, California: near Ward. I have seen some collections made in Wild Horse Canyon, that gave an ecological association of "Joshua tree woodland." However, I don't think I have ever seen Joshua trees in Wild Horse Canyon. I contacted the collector who was quite certain that there were Joshua trees in the area, but that they were not recovering well from the 2005 Hackberry Complex fire. So I went to the location of the collections, as given in geographic coordinates, and searched for Joshua trees. The location is shown in the photograph at left. I searched both sides of the road, across the wash and up on the benches on either side of the wash. I did not find Joshua trees. I did find burned stumps and sprouts of Banana Yucca (Yucca baccata) and Mohave Yucca (Y. schidigera), but not Joshua trees (Y. brevifolia). I'm not saying the Joshua trees aren't there. I'm just saying that I could not find them. Wild Horse Canyon Road is the gray gravel road in the left and center distance. Field Notes: 15-Oct-05 in Wild Horse Canyon. Looking east on the road to Winklers Cabin, 15 Oct 2005. At the south end of Wild Horse Canyon is a formal trailhead for a trail that goes north approximately 10 km to Mid Hills campground. The trail was always there, what has changed is the formal designation as a "trail." I guess we need trails since it's a national park. I just think there are some better places to mark and build trails. Wild Horse Canyon Road - Mojave National Preserve: Wild Horse Canyon Trailhead. Patchy burned areas in lower Wild Horse Canyon. The fire came down this face of Wild Horse Mesa in the lower canyon, leaving patchy areas unburned. Photograph taken June 27, 2005 by Phil Woodall, used by permission. Wild Horse Canyon Road - Mojave National Preserve: in lower cyn. Effects of the Hackberry Complex Fire in Mojave National Preserve, June 22-25, 2005.: 232510. Looking south into Wild Horse Canyon. The fire burned both sides of the road in this section. However, there are some patches of unburned vegetation on the other side fo the wash and up near the rim of the mesa. Photograph taken June 27, 2005 by Phil Woodall, used by permission. Effects of the Hackberry Complex Fire in Mojave National Preserve, June 22-25, 2005.: 232540. Burned slopes in mid-Wild Horse Canyon. The fire burned right down to the wash and road in the mid-section of Wild Horse Canyon. Photograph taken June 27, 2005 by Phil Woodall, used by permission. Effects of the Hackberry Complex Fire in Mojave National Preserve, June 22-25, 2005.: 232530. I also found the patterns of light and dark interesting, each dark place marking the former location of a shrub. Field Notes: 7-Jun-06 in Wild Horse Canyon. Wild Horse Canyon Road - Mojave National Preserve: mid Wild Horse Cyn. Snow on north face of Wild Horse Mesa, 19 December 2008. Wild Horse Canyon Road - Mojave National Preserve: mid-Wild Horse Cyn. Wild Horse Canyon Road - Mojave National Preserve: in mid-Wild Horse Cyn. The outcrop in the left middleground is the same as seen in the previous photo, and has a small south-facing rock shelter at its base. Wild Horse Canyon Road - Mojave National Preserve: in lower Wild Horse Cyn. In the early years, hiking groups tended to stay together. In later years, it seems we broke up into smaller and smaller groups. Lobo Point Road: along road. Where I parked to hike up to my experimental plots. View north on Wild Horse Canyon Road. Wild Horse Canyon Road - Mojave National Preserve: Columbia Mountain. A couple of skinny cows. It's pretty clear what they don't like to eat: Acacia greggii, Prunus fasciculata, and Salazaria mexicana. Lobo Point Road: near Wild Horse Cyn Rd. Large knob of granite in the Mid Hills near Wild Horse Canyon Road. This one had Golden Eagles nesting in a crevice near the top. Wild Horse Canyon Road - Mojave National Preserve: Granite Tor. Wild Horse Mesa is on the right (west) side of the road. The rock layers on the side of the mesa are welded and airfall tuffs. Wild Horse Canyon Road in the lower part of the canyon, view looking northwest, and up the canyon. At this location, Wild Horse Canyon Road drops off the bajada, and into the wash. A thicket of Mohave Yucca (Yucca schidigera) can be seen on the right side of the road. The road passes between the two outcrops of mud flow breccia (lahar) seen in the middle distance. The east side of Wild Horse Mesa is seen in the background. Wild Horse Canyon Road - Mojave National Preserve: Lower Wild Horse Canyon. A small group of hikers discuss the next destination, while standing on the north rim of Wild Horse Mesa. A few Utah Junipers (Juniperus osteosperma), a Blue Yucca (Yucca baccata), some small shrubs and some grasses grow in the rocky surface of the mesa. Wild Horse Canyon Road - Mojave National Preserve: Top of Wild Horse Mesa. This photograph, taken from a ridge just north of Winkler's Cabin, looks south at the north face of Wild Horse Mesa. It shows that some areas did not burn, presumably because of the sparse vegetation. My plots in Frasera albomarginata may not have burned. Effects of the Hackberry Complex Fire in Mojave National Preserve, June 22-25, 2005.: 232320. North face of Wild Horse Mesa after the Hackberry Complex Fire. Field Notes: 15-Oct-05 north face wild Horse Mesa. The north face of Wild Horse Mesa after the Hackberry Complex Fire, June 22-25, 2005. Photographed April 1980, scanned from a print on 21 February 2018. Photographed April 1980, scanned from a print on 20 February 2018. Photographed May 2015, scanned from a print 14 February 2018. Photographed April 1980 at the head of Saddle Horse Canyon, scanned from a print on 4 March 2018. Willow Well on Wild Horse Mesa Road is one of many wells dug and maintained by cattle ranchers in the eastern Mojave. The "willow" is actually Desert Willow (Chilopsis linearis) a member of the tropical family Bignoniaceae (Catalpa Family). When this picture was taken, March 1998, the willows were still dormant and so they are the large gray shrubs around the tank. At an elevation of 1475 m, Willow Well is about the highest elevation I have observed the Desert Willow to grow. The boulders in the foreground are Precambrian gneiss. Wild Horse Canyon Road - Mojave National Preserve: Willow Well. Photographed April 1996, scanned from a print 8 February 2018. Jim Lons and Dan Rosen at Winkler's Cabin. This photograph was taken in about 1987 before the cabin was painted by the BLM. Winkler's Cabin Road: Winkler's Cabin (Site). Frequently Asked Questions: Winklers Cabin. CWi119820. Effects of the Hackberry Complex Fire in Mojave National Preserve, June 22-25, 2005.: 238020. Entrance to the Blue Jay Mine, caved following the Hackberry Fire Complex. Effects of the Hackberry Complex Fire in Mojave National Preserve, June 22-25, 2005.: 238040. Winklers Cabin burned to the ground. Effects of the Hackberry Complex Fire in Mojave National Preserve, June 22-25, 2005.: 238030. Looking east across upper Wild Horse Canyon from the hill above Winkler's Cabin. The site of the former Winkler's Cabin is just to the right and in front of the pickup truck. Photograph taken June 27, 2005 by Phil Woodall, used by permission. Effects of the Hackberry Complex Fire in Mojave National Preserve, June 22-25, 2005.: 232700. Site of Winklers Cabin, May 2012. Photographed April 1986. George Hilton, at right, is our field trip leader. Photographed April 1985. George Hilton, in the center, is our field trip leader. Moonrise over the Woods Mountains. Photograph taken October 15, 2005 from our campsite in Hole-in-the-Wall campground. Black Canyon Road - Mojave National Preserve: in Hole-in-the-Wall Campground. Field Notes: 15-Oct-05 at Hole-in-the-Wall. Wendy smiles embarrasedly knowing she's gotten into a picture while Matt copies down petroglyph designs at one of several petroglyph sites in the Woods Mountains. The road to Lobo Point from Wild Horse Canyon. Wild Horse Canyon Road can just be seen at the extreme left in two little gray patches from the gravel the Park Service has spread on the road. The little dirt road coming diagonally across the photo is the road to Lobo Point. My plot in Salvia dorri was in the general vicinity of my 4Runner that is parked in the middle ground. Field Notes: 15-Oct-05 north of Lobo Point. Photograph taken 22 April 2010. Field Notes: 22 Apr 2010. Class at Desert Studies Center. U. S. Interstate 15: 53000.